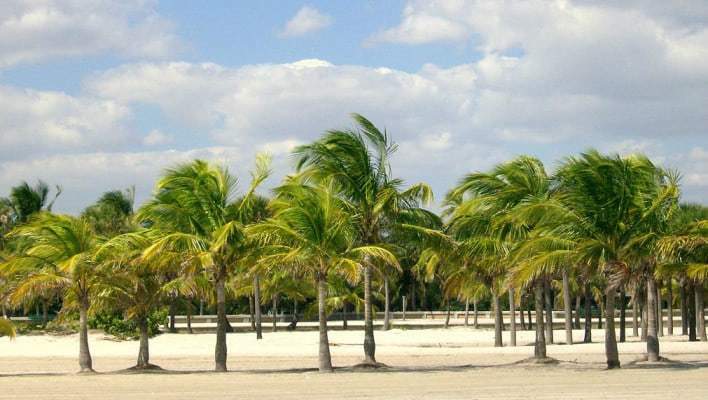 The Miami Florida area is known for its fabulous beaches but one of the city’s parks and beaches that is often considered a favorite is the wonderful Crandon Park Beach. 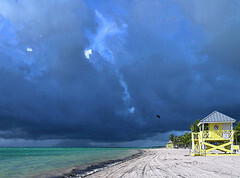 Crandon Park is located on the barrier island of Key Biscayne, sandwiched between the Atlantic Ocean and Biscayne Bay. This park and beach really has a little bit of everything to offer visitors. The Crandon Park Visitor and Nature Center is located on the barrier side of Key Biscayne but still has incredible views of the Atlantic Ocean. Visitors to the Park and Nature Center are welcome Monday to Sunday from 8am to 4pm and are invited to explore the various ecosystems of the key including the dunes, mangroves, coastal hammock, and the seagrass beds. You may also glimpse some of the local native fauna like the herons, the osprey, the beautiful wild butterflies, sea turtles, crabs, and sea stars. Or the flora like the beach peanut, Biscayne prickly ash and the coontie. The Bear Cut Preserve is reserved as an Environmental Study Area but you can still explore the area to catch a glimpse of what looked like it its natural state. In the preserve naturalists guide visitors through the hammock, ocean and beach communities and will point out any wildlife that you see along the way. Take advantage of the eco-adventure tours offered in the preserve, the self guided nature trails with the mangrove boardwalk to the stunning fossilized reef overlook, rent a kayak and explore the preserve from a different angle, relax on a guided tram tour, rent a cabana and take in the sights and sounds of the preserve as it lives around you, or follow the historical nature walk and take note of the birds and butterflies as they flit through the preserve. 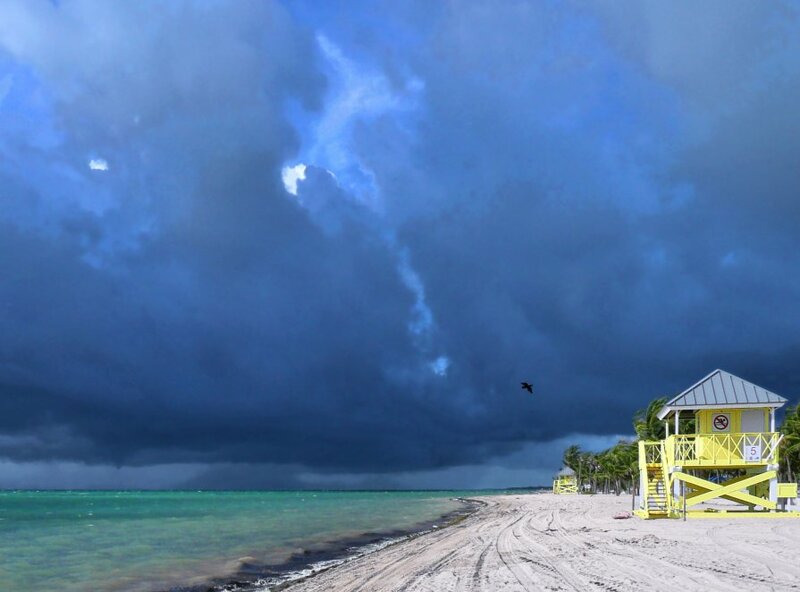 Guests visiting Crandon Park’s beach will understand why the two mile stretch of beach is constantly hitting top ten lists but they’ll also see that such popularity is a bit of a drawback as millions of visitors and residents flock to the area every year. It’s a combination of things that make Crandon Park’s beach so amazing, the pristine white sand, the calm ocean water, the winding promenade and ample parking and picnicking areas are a few of the main draws but obviously not the only highlights of the park. The beach is called lagoon style because of the calm waters along its shore, this occurs because of the sandbar that protects the beach. The sandbar is also a popular place for swimmers to explore as it’s typically easy to reach. The sandbar varies a bit as does the depth of the water at the shore’s edge. Lifeguards patrol the beach and posted surf conditions help insure the safety of beachgoers. For visitors who want to enjoy the beach but would like a little break from the sun and crowds there are cabanas for rent on a first come first serve basis. There are two stories of cabanas available and each 10×10 space offers a private shower and can be locked for privacy and protection of belongings. Cabana guests also get some special treatment with assigned parking spaces and exclusive picnic tables. The cabanas are available on a daily, monthly, monthly/weekend, semi-annually and annual basis. Now the natural environment and the beach at Crandon Park are remarkable and worth noting but there is so much more to this park it’s hard to believe all this excitement is in one location. The Crandon Park Amusement Center is another feature of the park that draws crowds. This amusement center is fun for all ages with different activities to check out. The Crandon Park Carousel was originally built in the 1950s but in the 1970s it fell into disrepair and was stored for 20 years. In 1998 the carousel was once again opened to the public after extensive renovations and assistance from volunteer artists from the New World School of Arts. In addition to the carousel there is a roller rink which is paved and banked with guardrails for safety and a central median with benches for watching the action. You can bring your own rollerblades to the rink or you can rent traditional ones right there. The seahorse fountain is geared toward the younger set but what parent doesn’t delight in seeing their little ones playing in the water. And don’t forget the Crandon Park Gardens which appeal to everyone. This 200 acre garden was once the site of the old Miami Zoo but now is a remarkable oasis with winding trails, a tropical rainforest and hardwood grove and still serves as a hospitable home to a large number of critters. Believe it or not this is not all that Crandon Park has to offer, the Crandon Golf Key Biscayne golf course is a wonderful way for a duffer to spend an afternoon, especially while the family is entertaining themselves at the beach. This championship 18 hole golf course has been the site of the Senior PGA Tour for the past 18 years and has seen some of golf’s top players attempt the challenging par 72 course. The seventh hole in particular is known for its difficulty and beauty and is often called “One of the Greatest Holes in Golf”. Golfweek has even seen fit to give Crandon Golf Key Biscayne a place in its top ten courses. If you are not quite up for a full round of golf but want to get in a little practice, the practice facilities feature a lighted driving range for practice almost any time of day and some incredible putting and chipping greens for use during the daylight hours. And don’t forget to take your foursome out for a meal you won’t soon forget at the Links Grill. The grill features light American favorites with touches of South America. If the weather permits make sure to enjoy your meal on the outdoor veranda so you can soak up the beauty of this amazing island. The Links Grill is open from Monday through Sunday 7:00 am to sunset. Crandon Park is a great way to explore Miami as it offers a little bit of everything but is comfortably removed from the heavy traffic and congestion of the city itself.